Download Free Vector Blogging Blogger Template: Vector is a Premium Blogger Template that is most suitable for pure blogging sites. Vector Premium Blogger Theme is for those who are blogging on Technology, Fashion, Sports, Video, Healthy Living, Travel&Tourism, etc. It is 100% Search Engine optimized. 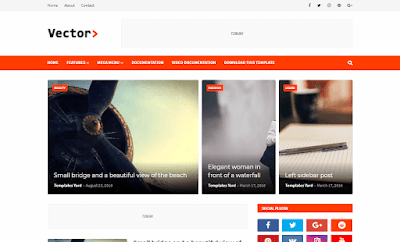 This premium but free blogger theme is an excellent Blogger theme for Magazine, Newspaper and Blog websites. It is 100% Responsive on every device. It makes your content beautiful on phones, tablets, and desktops. Your audience can expect beautiful looking content whether they are visiting your site on laptop, or on their mobile device. Vector Premium Blogger theme is loaded with lots of awesome features. Freebloggertheme.com is a Free Blogger Templates Forum for all blogspot bloggers. We provide Responsive, Seoptimized free Blogger templates. For more on templates installation and customizing, blogging tutorials, blogger hacks, SEO optimization tips and tricks visit BloggerThemeForum always!